When deciding on the fitness equipment that will be suitable for you, AND your work environment there are two main considerations. What is your main objective? Do you want to lose weight, promote more blood circulation, burn calories at work, improve your muscle tone? What is your main area of concern? Upper body? Lower body? Do you need exercise equipment for your hands? This one can be a little tricky. 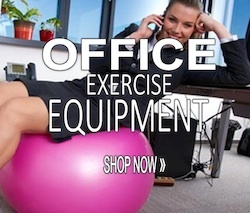 Is your boss supportive of having exercise equipment in the office? Will it need to be quiet, portable, fit under the desk? Is the company paying for it or are you? Will it be affordable? This category is written to cover both upper and lower exercise equipment that can easily store under your desk or at your desk. The equipment in this category does not require you to change anything at your workstation. A. Under Desk Pedal Machines – this category encompasses three styles of machines you can ‘pedal’. Under desk elliptical – not just for using your legs under the desk. There are models that have resistant band attachments as well as durable enough for standing on. Go here for more on the portable mini elliptical machines. Under desk stepper – some are designed only for sitting and are lightweight, meaning they cannot tolerate the full weight of an adult. Others can be used standing or sitting. There is one other classification of mini stepper that although it doesn’t fit into the under the desk classification it does qualify as a portable exercise machine so I have included it here with the other portable mini steppers. Pedal exerciser – these are from very low price of $20 up to around $160. The price variance is closely associated with functionality, durability, and accessories. Some are motorized and others the resistance is adjusted manually by friction or magnetic. Some of the important things to consider are their height – allowing for desk clearance, and if they will slip over the floor. There are three separate classifications on this under desk pedal bike comparison page. B. Arm bike – Some of the arm bikes are a versatile component of the foot pedal exercises as listed above. They can be used as is, just place them on the desk, and others come with accessory attachments to make the conversion. There is one arm exercise machine that can actually be used while exercising your legs at the same time. Exercise Chairs and Resistance Chairs – Some of these can also belong in the category below since some are a stand-alone piece of equipment that would replace your existing office chair. There is also a great attachment that can be attached to your usual chair that converts your regular office chair into a resistance / exercise chair as well. The resistance chair was originally designed for rehabilitation and therapy for mobility impaired persons and has additional equipment available for shoulder exercises and a recumbent bike attachment. You can read more about the Resistance Chair Exercise System here. The other product that falls into this category is an attachment that converts your office chair (or any chair for that matter) into an exercise chair – it is really excellent and versatile and can target 25 muscles in one workout. Use it for seated exercise or standing. Definitely worth the price. Read this and find out more about the OfficeGYM exercise chair. Similar to the Resistance Chair Exercise System is the Chair Gym. It has higher ratings than the Resistance Chair and lots of happy customers. Being recommended for people who don’t have time for the gym or have mobility issues. Lightweight, well made, and stores away easily (folds up like a lawn chair). Here is the Chair Gym. People suffering from Carpal tunnel syndrome (CTS), arthritis, recent surgery, or cartilage damage; could really benefit from hand exercises and the use of equipment specifically designed for this purpose. One such piece of equipment is the Xtensor Hand Exerciser. People who have broken their wrists, suffer from CPS, tennis elbow, and even musicians who want to build their hand strength. Ergonomic office footstools can really help you to sit with better posture as well as taking the pressure off your legs to encourage better circulation. One really nifty style of footstool has wheels and was designed to encourage foot movement while you are working. Find out more about the Weeble wheeled footstool . The mini steppers are great to keep under the desk and to stand on and step away during office hours. Durable and light for ease of use. Now you can get all your steps in while you make calls, answer emails, even use these great fitness tools during a meeting. These mini desk steppers come in a variety of styles. 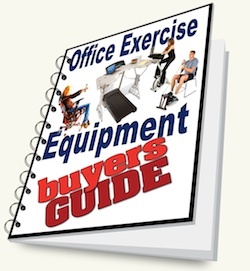 This category covers both upper and lower body fitness equipment designed for the workplace, but is specific in its use and will require a new office space or redesign. Adjustable Height Desks can be made for standing, to add exercise equipment to like a treadmill or a bicycle. They can also come with the ability to tilt. Locus Workstation is a relatively new design to the standing desk market and quickly becoming more and more popular because of its unique ergonomic design with the added support of the leaning seat. G. Treadmill Desks are similar to the standing and adjustable height desks but are made to be with one another (the treadmill and the desk). The Treadmill Desk has a large desk and includes the walking treadmill. These product designs seem to come and go as newer products come to market. H. Under desk bikes are often one unit with bike and desk together and others are just cycles and chairs together. The Bicycle chair has an attachment specifically designed for the chair, similar to the Smooth Rider II exercycle. Recumbent Bike for Desk is a lower profile machine that can slip under your desk. You might want to try these out before you buy since they aren’t cheap and you want to be sure that the seat is high enough so you can work effectively PLUS you don’t want your knees banging under the table. Upright Bikes With Desks are all in one unit that will allow you to have a computer desk on your bike. This one by FitDesk also has a few accessories so you can have your office needs in hanging pockets. They also make an attachment that you can put on your own bicycle if you choose to prop it on a spinner instead. Find out more detail about the FitDesk here. Balls for Office Chair instead of a chair has its good and bad points. The ball is softer on your keister and doesn’t cut off the blood flow on the back of your thighs like a regular chair does BUT don’t throw out your old chair yet. Find out more about using a ball instead of a chair. Stability Balls with Base is a popular hybrid to the old style office chair and using just a stability ball. Some have back supports and others just a base on wheels. Used properly it can improve posture and activate your core, used improperly you might be worse off. Find out the good and evil on office chair balls on a base. You may have noticed I have also included various ergonomic office furniture pieces as well. Having an ergonomic workstation can also improve your metabolism and help to achieve your fitness goals. We have an office of 40+ employees and most of us are stuck at our desks all day. We are in Florida so a short walk during the day would require a shower or lots of girly smelly things. Our office has been remodeled and I’m not sure what would fit under our desks or if management might allow some equipment for those that are not a receptionist….. “ME”. Most companies are getting on board with allowing and encouraging employees to exercise during the work day. One great under desk exercise machine is the DeskCycle. You can read a full review of it on this page here.